I was asked recently about how I would be going about decorating for holidays, now that I have decluttered so much, and deciding to take a more minimal approach to what I have in our house. Honestly, I really wasn't sure how to answer that right away. So I've given it some thought. 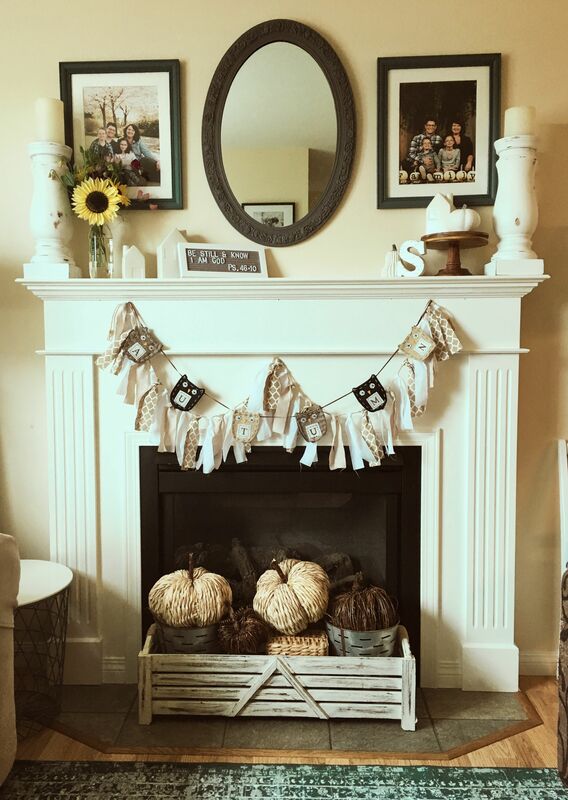 And in the process of decorating for Fall I took some notes. So here goes! Last year I had actually gone through and downsized my decorations without even knowing I'd be taking part in this HUGE life altering declutter journey. I just knew I wasn't using all the items I had, so I got rid of some. First, some back story on the way I used to decorate. I can sum it up in just a few words- More was Better! 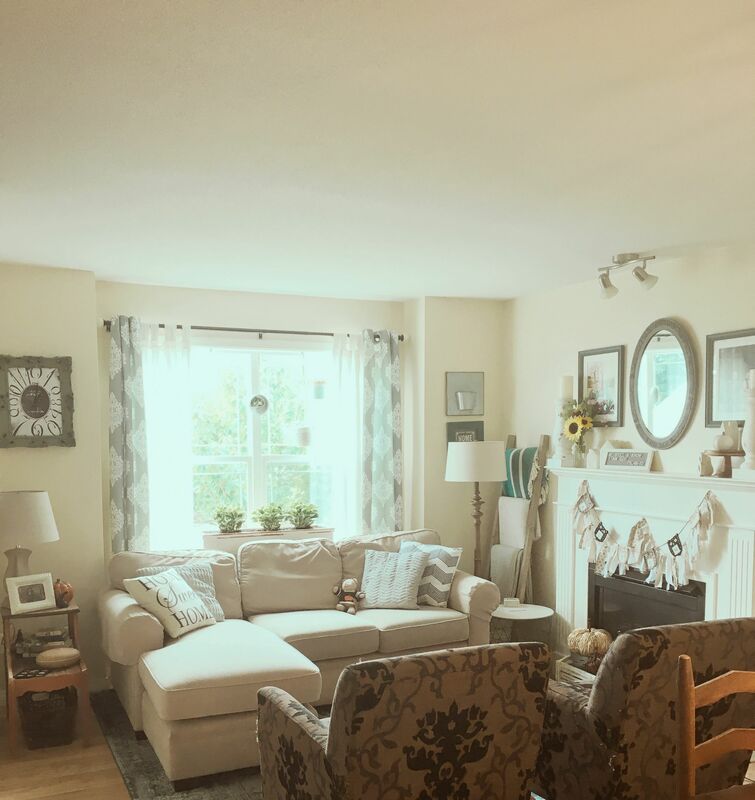 Last year was initially when I began to notice that the amount of things in my house and the amount of time it took me to clean everything was completely overwhelming me. I hadn't found the Allie Casazza method yet, but I knew I was tired of feeling like it had become a huge chore to bring stuff out, set things up, pack other stuff away and so on... Instead of each new season being joy-filled and fun, I felt it had all become part of a list of expectations I had put upon myself in my "mom-life". So, here are a few things I have found to be helpful when decorating for seasons and with owning less! Downsize anything that you aren't using every time certain seasons roll around. No more, "Well, what if..." Just get rid of it! 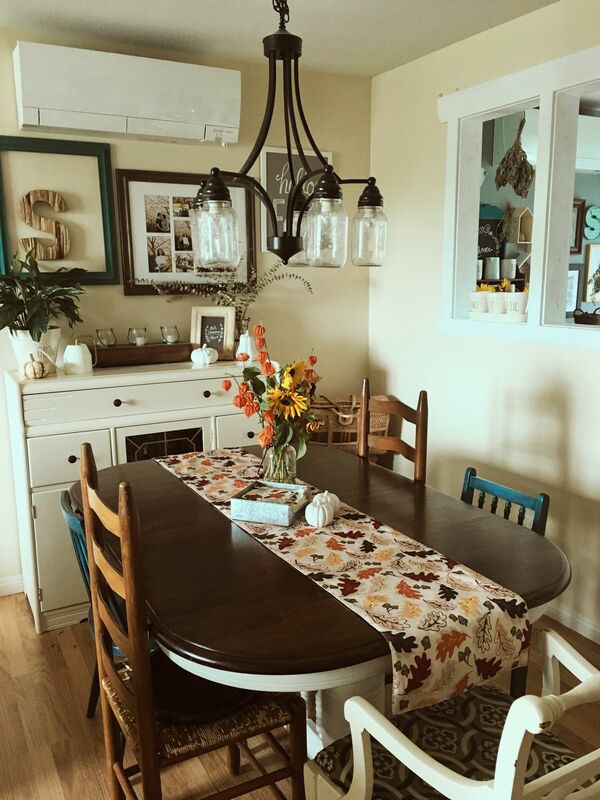 When purchasing everyday pieces outside of your seasonal decor, choose more simple items that you love and add only a few accent pieces. Only buy pieces that you truly love, and honestly, are timeless. Every year someone out there sets the new trend for the latest season. And I have found that having fun with a new piece here or there is great, if you actually like it. BUT I have also found there are always those key pieces that arrive out on the shelves every year that I actually love. My little faux white pumpkin collection would be an example of the timeless pieces I have and they never seem to go out of style for me. Seasonal napkins, paper or cloth, can add a nice punch of color to your table without being overwhelming. 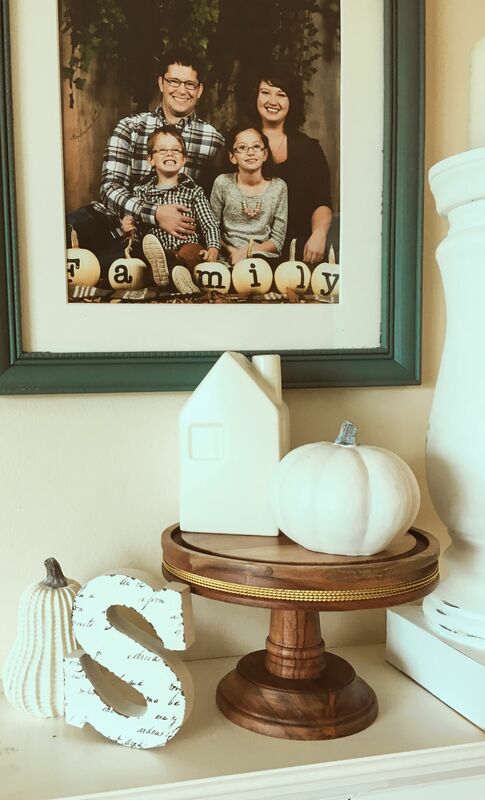 For fall, I love that you can buy faux pumpkins in all colors, shapes, sizes and textures. I love the more natural pieces for myself in a muted color pallet, but that hasn't stopped me from grabbing a couple orange pumpkin pieces to add touches of the fall colors inside too! Fresh Flowers that are seasonally available. My sunflowers were amazing for the first time ever this year and have been an endless supply of joy and color in our house. So run to the grocery store if you haven't got your own and grab a bunch! I find them for as little as $3.99 for 3-5 flowers and thats more than enough to create a bold splash of Fall in any room. Use what you have. This was how our parents and grandparents did it! And this can be a great help for those of us that find we haven't got the money to splash about every new season (I know I don't). But lack of funds doesn't mean we can't do something to bring the season of outside indoors. So that is exactly what I have done for a number of years! Bring the outside in! If you have a garden or yard, chances are some of your foliage is turning those lovely colors of fall. Cut some and bring them in. Pop them in a large mason jar with your sunflowers. And don't be afraid to try something that may not look like "enough" outside. Inside it can take on a whole new life with the sunflowers by its side! Stop decorating with the trends always in mind. Figure out what you like and get to know that part of yourself. Instagram will post your pictures whether you are copying the cover of some home magazine or not. Stop worrying about what others say you should like and be original! It's not about the likes! Free Printables! Pintrest is FULL of them and when they cost either nothing at home to print, or very little at your local print-shop,they are a pretty great bargain! And they don't take up a bunch of space to store, or display! I like to have a few frames around my house in among my family photos to display these printables. So go take a look and get printing! Fall Family Pictures. Every fall we attend a local farm's Pumpkin Festival. They always have a photographer set up a booth there and we always make it a priority to book into their sessions. This is a bit more financially, but we find it worth saving a little aside to ensure we are all in a family photo set together once or twice a year. I will have these printed ASAP and put them in the frames I have set out specifically to show the latest in our family pictures. I have two spaces I like to do this. 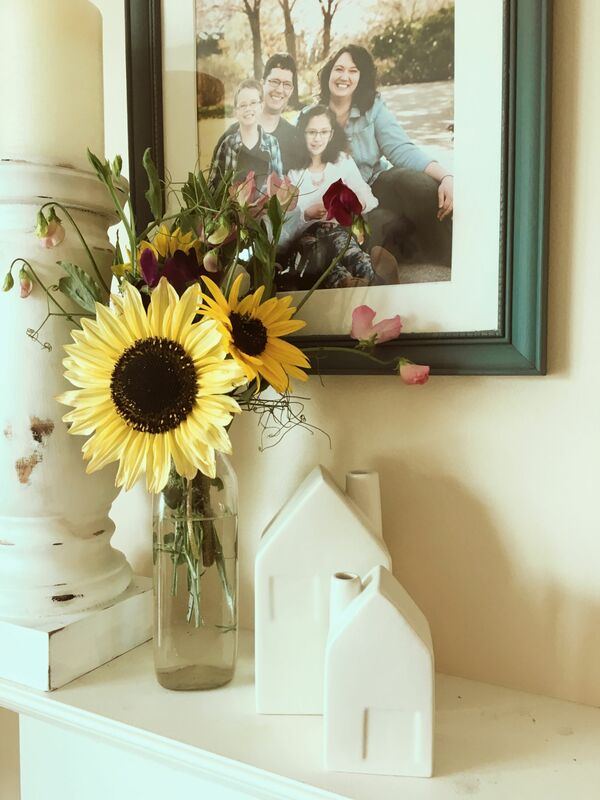 A set of two frames over the mantel in our living room, which I will show the previous spring session and that recent fall photo, and a multi frame about our buffet that will be filled with all my favorites from the session. Most importantly when it comes to decorating, whether it be for everyday or seasonal, and I have touched on this already, but will say it again, as I have learned it to be the most important. Be yourself! Choose the things YOU love. Stop comparing yourself to pinterest and instagram. Those photos are not you. Not your family. Not your life. So when you set out to create a home-because lets be real, I want to live in a home, not a showroom- create it from things and pieces that represent you. And if you don't know who that is, it's time to take a look at yourself and figure it out. Life is too short to constantly be striving for the next "best things" as the world would have us do. You deserve to be content. To wrap this post up. Friends, we have been fed the lies that more is better. More is to be content. Keeping up wth the Jones' is how we find joy. And it's all a ploy. A major ploy to have us buy more and live beyond our means that we have been blessed with. For us always to feel like we are missing out on life if we live without a certain thing. But it's all a lie. And I hope that you will join me in this journey back to a simpler time. A time before mass media took over and was able to feed us this lie through every one of the many screens we have in our homes, and to strive for contentment. To strive for a life with less. And to desire more of what is most important. For me, that means, my time with my Lord, Jesus Christ. Time for myself. Time spent with my family. Our homes, as wonderful a gifts as they are, don't let it become this major burden as I have in my past. Don't let it smother your joy.